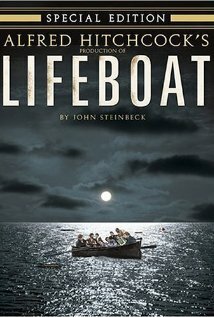 Using a story by John Steinbeck as inspiration, master of suspense Alfred Hitchcock stages a gripping World War II drama by cramming eight survivors of a German torpedo attack into the hull of a tiny lifeboat. 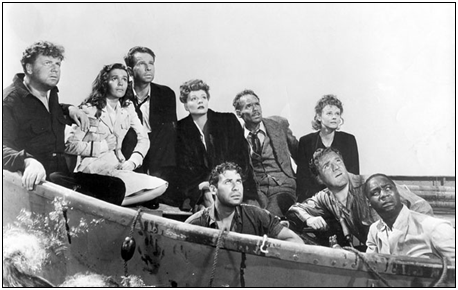 All of the fantastic elements that Director Alfred Hitchcock manipulated so well during his reign in films are on full display here in his 1944 war drama, “Lifeboat” Written by brilliantly by John Steinbeck, the drama tells of a wartime maritime disaster that thrusts a diverse band of strangers, from a Radio Operator to a U-Boat Captain, together in of all places …a lifeboat. It features an incredible cast that consists of Tallulah Bankhead, Hume Cronyn, William Bendix, Mary Anderson and Walter Slezak. The film takes place on on set. The lifeboat. The ocean, a set onto itself, is expansive and menacing, is shown using some good rear projection. The characters while enduring the harshness of the open ocean in their limited setting, distrust the U-Boat Captain that does not seem to understand them and has a way with navigating the lifeboat on the open sea. As they get hungry, thirsty and desperate the paranoia increases. Here Hitchcock shines as we get to know each of the characters flaws and fears. One survivor claims to be holding a bundle which she thinks is her dead baby. When Walter Slezak reveals that he is indeed a nazi is when things go sour. The film becomes, shocking, thrilling and even cerebral as it teaches a lesson about fear, paranoia and survival. Hitchcock wonderfully controls the environment with wonderful medium close ups and perfect composition. The film is full of natural and believable performances that outshine even by today’s standards. Hitchcock and Steinbeck both were nominated for Oscars. Hitchcock his second and Steinbeck his first. This is a classic film that cannot come more highly recommended. 10 out of 10? Wow. I’ll have to check it out. Hitchcock is one of my favorites. Yes, I liked it that much. I am a huge Hitchcock fan so maybe I’m a little biased. It’s a very unique and fascinating piece of film-making. Enjoy it. Thanks for reading! Excellent film! The suspense and isolation make it a half-step from a horror movie. Killer write up, Vic! Proves to show how Hitchcock was so damn ahead of his time. Thanks for swinging by, Bill!